Whether you’re talking about laptops, smartphones or virtual reality headsets, you can’t slow down progress and eventually all things evolve. Such is the case with the new VR headset from Oculus called the Oculus Rift S.
While this new-and-improved headset might sound a bit confusing at first, we promise the lineup of new headsets isn’t complicated to understand. To start, understand that the Oculus Rift S isn’t the Oculus Rift 2. It’s an evolution of the hardware, absolutely, but not a radical departure from the base headset you know and love. For that reason and others, Oculus will phase out the original Rift in the near future. So really what you’ll have to decide between if you’re planning on buying a new Oculus VR headset in the next year, is the PC-powered Oculus Rift S and more mobile Oculus Quest. But then again, you may want to pick up an Oculus Rift while they're still available. But don’t worry, we’re here to breakdown the pros and cons of each to help you decide which Oculus VR headset is best for you. Both the Oculus Rift S and Oculus Quest certainly have a lot in common, including the same game platform that will play most, if not all, of the same titles, and a shared software experience that will look familiar to anyone who’s used an Oculus product in the past. And while both the upcoming headsets look similar in their matte black, perhaps the biggest difference between them is in maneuverability. Despite no longer needing external tracking stations, the Rift S will still need to be tethered to your PC as it doesn’t have a GPU built-in - it's the same issue which holds back the Oculus Rift, though not as prominant. That’s very different from the go anywhere nature of the Oculus Quest that doesn’t need to be plugged into anything. In addition the Oculus Rift S could prove to be the more comfortable headset of all three, with the Rift S switching out the old tri-strap headset design for a halo shape that is adjusted by turning a knob on the back of the headset. The aim of the new design is to allow players to wear the headset for extended periods of time. The Quest also makes improvements to comfort with its new cloth-like material and rubber straps, which fit snugly over the head. But we found the Rift S left less red marks on your face after prolonged wear. This is definitely an improvement from the Oculus Rift with its chunky black headset and frequent nauseated aftermath. However, it's worth noting that the Oculus Rift S’s refresh rate has been lowered to 80HZ from the Oculus Rift’s 90HZ - so actually the Oculus Rift has a better refresh rate than its successor. While the Oculus Rift S’s wired headset may prove a pain in terms of restricting movement, not having a GPU built in leaves tons of head room when it comes to graphical fidelity. The Rift S offers a new fast-switch LCD screen, a 2560x1440 resolution display and improved lenses that, we found, were less reflective than the lenses used previously in Oculus headsets. But while the Quest offers more room in terms of movement, it is a bit more stifled in terms of graphics. The Quest won’t have quite the same visual fidelity as the Rift S, despite being better than the Rift S in terms of optics, the Quest’s GPU limitations means that textures don’t look as sharp as they do on the Rift S.
The Oculus Rift certainly doesn't match its successor's specs, with a resolution of just 1080×1200 per eye and two Pentile OLED displays. Being an original VR headset, the Rift doesn't quite offer the graphical quality VR is now capable of and that certainly holds it back. 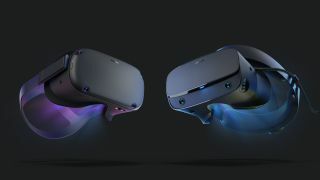 According to Oculus, the Rift S is completely backwards compatible with the original Rift titles, and the company plans on making the Rift forward compatible with the vast majority of games released for the Rift S and Oculus Quest (with some minor exceptions). That said, while you'll definitely see the same games in each of the stores, buying one on the Oculus Rift S or Oculus Rift doesn't automatically score you a version on the Oculus Quest–it might but, according Oculus, that decision will be down to the devs. Meanwhile, Oculus has confirmed there will be over 50 games available on the Oculus Quest headset when it launches. The most exciting of the lot is a three-part experience developed by Lucasfilm, ILMxLAB and Oculus called Vader Immortal that takes you to the planet Mustafar. ILMxLAB has worked on a number of Star Wars-based VR experiences in the past, but this one will be exclusive to Oculus’ standalone headset. Alongside Vader Immortal, Oculus has confirmed Quest ports for Dead and Buried, Dead and Buried II, Superhot VR, The Climb, Face Your Fears, The Unspoken, Robo Recall and the uber-popular rhythm game Beat Saber – all of which will be optimized for the mobile processor. We also expect a number of Quest-only games to be announced before the headset arrives on our doorstep in 2019. If you're not wanting to take the risk however, and would rather be sure there's a good library of games already available, then the original Rift could prove a more viable option. There are plenty of games already on the market for the headset and the promise of forwards compatibility means you shouldn't lose out on the biggest new releases - though they may not look as good as they would on the Quest and Rift S.
The Oculus Rift's setup process isn't extremely complicated, but it is a little bit fiddly - especially if you haven't used a VR headset before. While we don’t know much about the Oculus Quest’s setup procedure, we do know Oculus is keen to simplify the setup process of the Oculus Rift S. This simplified process will involve a new Passthrough+ mode that allows you to setup your Guardian system, which makes sure you don't wander anywhere you shouldn't while in VR, without taking off the headset and should make that slightly convoluted setup process a bit more manageable for first time VR adventurers. So let’s talk about price. Surprisingly, the two headsets will be priced roughly the same. The Oculus Rift S is set to be priced just $50 more than its predecessor, meaning it should retail for around $399. The Oculus Quest will also cost $399 (likely between £349 and £399) - making both headsets around the same price as a new 4K game console like the PS4 Pro or Xbox One X. Similarly, both headsets are due to release in Spring 2019. The Oculus Rift is priced at roughly $349, making it the cheapest option - but not by much. It may be available right now, but for a $50 difference it’s arguably more efficient to invest in the upcoming headsets. The Rift S is for those of us with gaming PCs who are looking for the more definitive VR experience and you also don’t need to worry about running out of storage (the Quest, remember only has 64GB of storage). If the idea of shelling out for a gaming PC doesn’t sit well with you–or if you’re the kind of person who’d rather have a portable system that you could take with you–the Oculus Quest is the better choice. Not only is it more portable but, because it doesn’t have a wire, it’s probably a bit safer, too. There’s not much in it with the upcoming Oculus headsets, with both costing the same and releasing at the same time. However, if you value performance over maneuverability then the Oculus Rift S is probably a better choice of those two. But if you value performance and movement without physical limits then opting for the Quest could be your best bet - even if performance is slightly sacrificed for this freedom. Meanwhile, the Oculus Rift may be a few years old but it does offer a cheaper option that will run the average VR title (even if the quality isn't as good as it would be with the other two). If you would rather have a VR headset that does what it says on the tin without all the bells and whistles, then you're probably best to opt for the original Oculus Rift while you can still find one.